Looking for a fun new toy for your toddler? Look no further than the Roll & Learn Activity Suitcase from VTech! This travel-themed learning suitcase features an interactive activity panel on its front with four light-up piano keys, a removable phone, fun dog character, spinning gears and more. Children can open the suitcase to pack their things and an easy-grab handle lets them take their fun on the go. 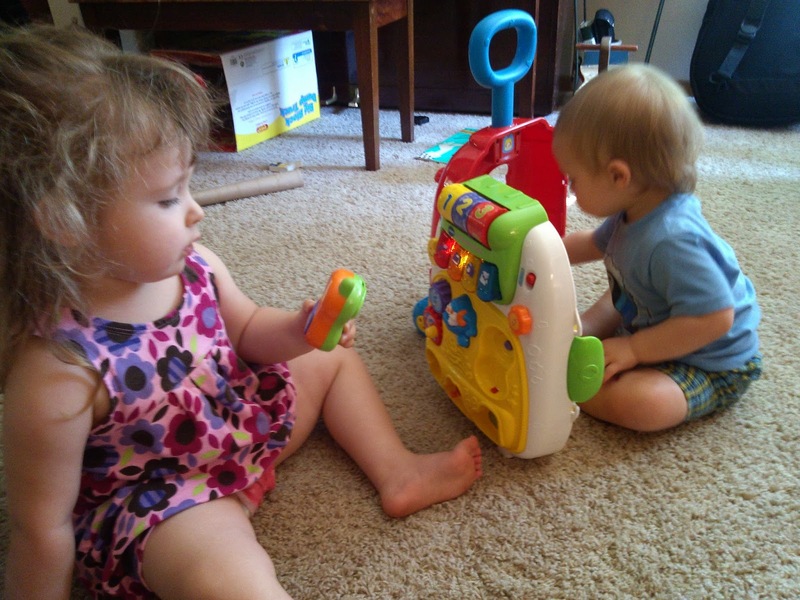 Bobby (1 year) and Sophia (almost 3) had a blast helping me review the Roll & Learn Activity Suitcase last week. They were so excited as I opened the box to take it out that they couldn't even stay back long enough for me to remove it all the way! Bobby started pressing buttons, removing the shapes and cell phone, and enjoying the 25 different melodies. He was fascinated by the lights, sounds, and interactivity of the suitcase. Sophia, who is a little older, was more interested in figuring out what she could do with the suitcase. The learning mode teaches English and Spanish, modes of transportation, and famous places - which was more suited to Sophia's learning level. 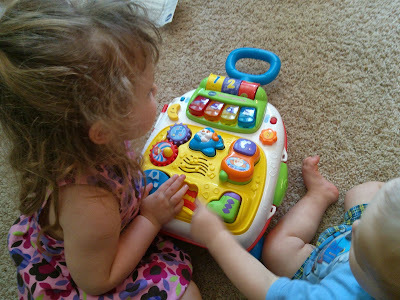 She wanted the cell phone to have more interactivity, so that was maybe one area of this item I would suggest improving. But other than that, she seemed to enjoy it as much as Bobby - especially when she discovered she could roll it around behind her and put stuffed toys inside it. We decided to use the suitcase to have a little picnic in the kitchen, so we put some snacks inside it and rolled it around the house to our picnic blanket. Sophia and Bobby loved this, and the suitcase played songs while they ate. I would definitely recommend the VTech Roll & Learn Activity Suitcase for toddlers - It's recommended for 12-36 months and it has features that children of any level within that range can appreciate. It's one of those toys that you discover something new on it the next time you bring it out to play, so I think it will keep the kids entertained for a long time! More about VTech: The Roll & Learn Activity Suitcase is part of VTech’s line of developmental stage-based infant and preschool learning toys that provide the appropriate tools for every age and stage of a child’s development.With nearly 40 new product introductions in this category this year alone, VTech has one of the largest lines of infant and preschool electronic learning products, each one chock-full of play value for unlimited, open-ended fun. 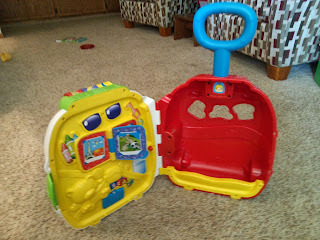 Enter to WIN a VTech Roll & Learn Activity Suitcase below! I would love to win because my son would really enjoy this, especially because of its 25 melodies. I'd love to win because my daughter would love to drag it around the house and that it makes sounds! I would love to win this because my son would adore it! I would love to win this for my youngest - she would adore it! Id like to win because my granddaughter has a Barbie rolling luggage that shes always pulling around. 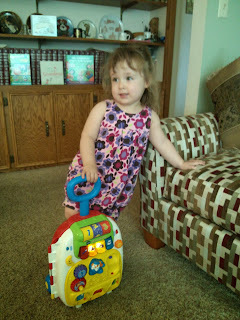 I think she would enjoy the vtech suitcase. 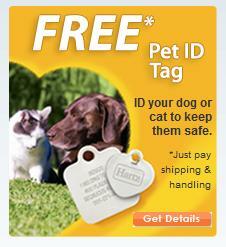 I am always looking for new toys for my children - my daughter would love this especially! 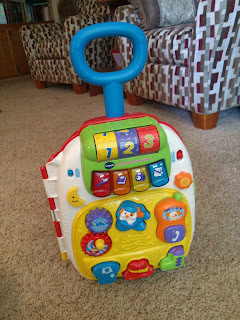 I would like to win the Vtech Roll & Learn Activity Suitcase for my 2-year old grandson;as this is a great learning tool to help enrich his vocabulary and speech.